A Great Tool For Effectiveness! What is a time management chart? A time management chart is one of the most effective ways of planning your time. While many people use planners and to-do lists and these are all great tools, only a time management chart can help you allocate time to all areas of your life. The chart helps you allocate time to specific activity types in your day like work, study, family, exercise, romance etc rather than specific projects in your life. Then you focus on any projects that need doing during that block of time in that area. For example if my time chart blocks off ‘administrative tasks’ for me from 9 – 10 am every morning, I will use this time to check my email, return phone calls, file my paperwork etc. From 11 am – 12 am I may have blocked of interacting with my team or co-workers and this is when I can schedule meetings, catch up on the office buzz, take a coffee break and do a bit of socializing etc. What are the benefits of using a time management chart? The first benefit of using this tool is that it is a visual tool which makes it easy for you to follow it and implement what is outlined. Rather than never ending to-do lists, this tool allows you to perform tasks based on the time period assigned to that particular kind of activity type rather than assigning times to tasks. Since most of us juggle multiple tasks both at work and at home a time chart allows us to balance all aspects of our home and work life. Since you can schedule tasks based on your activity levels you know when to schedule things when you are at your performance peak. E.g. if you are a morning person, you may want to schedule brainstorm/idea generation time first thing in the morning and return calls and check emails during your afternoon slump. Since time charts do not focus entirely on work related activity, it is easier to schedule time for fun, exercise etc using this method. Why a visual guide to manage your time is better than other methods? It has been scientifically proven that our brain responds better to text and images rather than to lists and text alone. This is why a visual representation of your time is much easier for your brain to perceive than a simple linear list. Using a time chart your brain can think divergently and hence you are able to schedule more into your week as opposed to a simple to-do list. 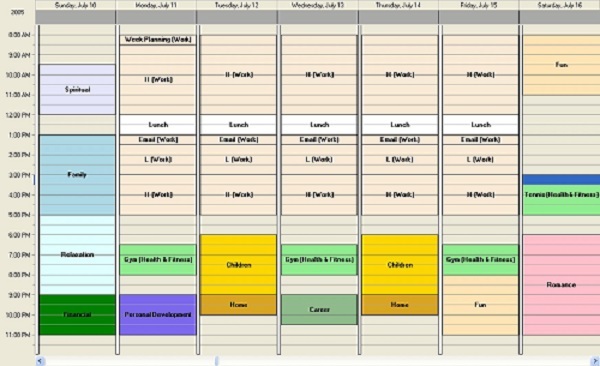 Time charts also provide you with your week at a glance, eliminating the need to check multiple schedulers and meeting makers etc. They also allow you to colour code ‘activity area’s to make it easier for you to look at information and also provide space for scheduling routine tasks like working out, or paying your bills etc. It is also easy to expand a time chart into a to-do list, though the opposite does not hold true. For example if you have time scheduled as ‘administrative tasks’ on your time chart, you can then make a mini to-do list for that time period. Some activity types that you can use to help schedule your time, though you can add your own. Personal activity types: Eating and cooking, Family, Running the home, Exercise, Relaxing, Children, Friends, Financial etc. Work activity types: Personal Development, Training, Emails, traveling, planning, meetings, phone calls, reports, reading, Strategizing, managing co-workers, follow – up’s, etc.